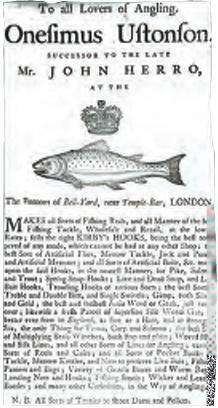 During the 18th century, the fishing industry became commercialized - rods and tackle were sold at the haberdashers store. After the Great Fire of London in 1666, artisans moved to Redditch which became a centre of production of fishing related products from the 1730s. Onesimus Ustonson established his trading shop in 1761, and his establishment remained as a market leader for the next century. He received a Royal Warrant and became the official supplier of fishing tackle to three successive monarchs starting with King George IV over this period. The most common salt water game fish are marlin, tuna, tarpon, sailfish, shark, and mackerel. In North America, freshwater fish include snook, redfish, salmon, trout, bass, pike, catfish, walleye and muskellunge. The smallest fish are called panfish, because they can fit whole in a normal cooking pan. Examples are perch and sunfish. The effective use of fishing techniques often depends on knowledge about the fish and their behaviour including migration, foraging and habitat. Fishing tackle is a general term that refers to the equipment used by fishers. Almost any equipment or gear used for fishing can be called fishing tackle. Some examples are hooks, lines, sinkers, floats, rods, reels, baits, lures, spears, nets, gaffs, traps, waders and tackle boxes. 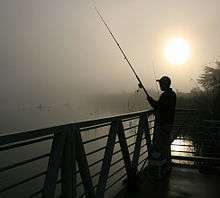 Recreational fishing has conventions, rules, licensing restrictions and laws that limit the way in which fish may be caught. The International Game Fish Association (IGFA) makes and oversees a set of voluntary guidelines. Typically, these prohibit the use of nets and the catching of fish with hooks not in the mouth. Enforceable regulations are put in place by governments to ensure sustainable practice amongst anglers. For example, in the Republic of Ireland, the Central Fisheries Board oversees the implementation of all angling regulations, which include controls on angling lures, baits and number of hooks permissible, as well as licensing requirements and other conservation-based restrictions. 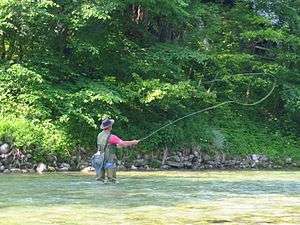 Regulations notwithstanding, voluntary catch and release fishing as a means of protecting and sustaining game species has become an increasingly common practice among conservation-minded recreational anglers. In addition to capturing fish for food, recreational anglers might also keep a log of fish caught, either in a physical form or with technology such as the FISHBUOY or Fishbrain mobile logging application, and submit trophy-sized fish to independent record keeping bodies. In the Republic of Ireland, the Irish Specimen Fish Committee verifies and publicizes the capture of trophy fish caught with rod and line by anglers in Ireland, both in freshwater and at sea. The Committee also ratifies Irish record rod caught fish. It also uses a set of 'fair play' regulations to ensure fish are caught in accordance with accepted angling norms. 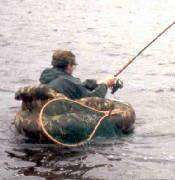 Several species, such as Cichla kelberi, C. piquiti and rainbow trout, have been introduced in natural or artificial environmental to the sport fishing. Some of these species have caused several impacts in aquatic biota. ↑ Horrox R and Ormrod WM (2006) A social history of England, 1200-1500 Cambridge University Press, pp 278–9. ISBN 978-0-521-78345-3. ↑ Fishing On! Media (2013) - "Fishing Tips and Techniques"
↑ A Standard for National Environmental Assessment of Tournament Fishing, 2009, RecFish Australia. ↑ Recfish Research Australia. Retrieved 26 June 2010. ↑ National Marine Fisheries Service (2014) “Fisheries Economics of the United States 2012” pages 6 and 8, NOAA Technical Memorandum NMFS-F/SPO-13. 1 2 Azevedo-Santos, V.M. ; Pelicice, F.M. ; Lima-Junior, D.P. ; Magalhães, A.L.B. 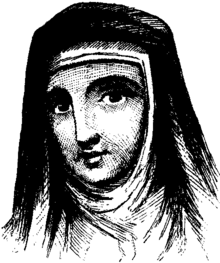 ; Orsi,M.L. ; Vitule, J. R. S. & A.A. Agostinho, 2015. How to avoid fish introductions in Brazil: education and information as alternatives. Natureza & Conservação, in press.